September 23, 2017 By This post may contain affiliate links. Conjure up some magic by serving a cheddar bacon cheese ball that looks like a witch’s cauldron. 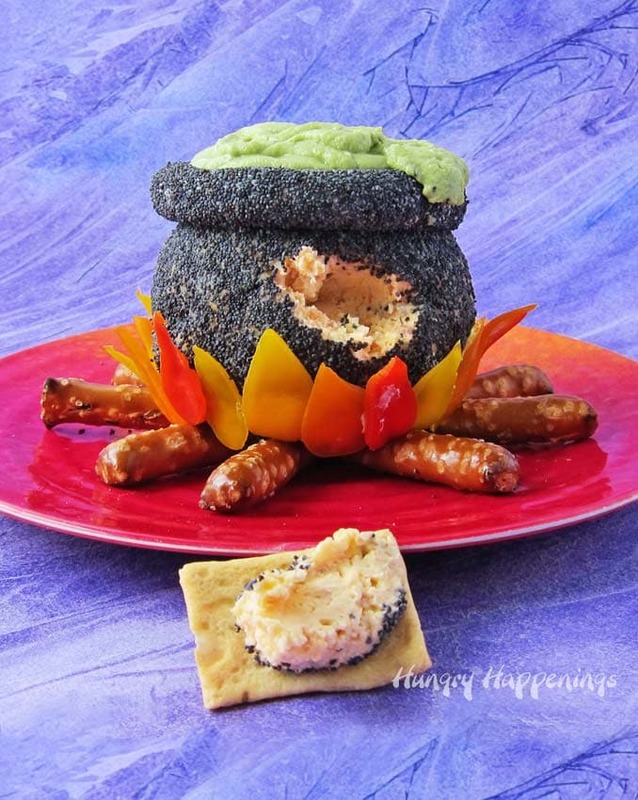 This poppy seed coated Cheese Ball Cauldron with orange, yellow, and red pepper flames sitting atop pretzel rod logs will enchant your Halloween party guests. A version of this Cheese Ball Cauldron is on the back cover of my book, Hungry Halloween featuring Movie Monster Munchies, Bewitched Buffet, and Dead Man’s Diner. It was one of the first recipes I developed for my book way back in 2010 and I was so excited about it. It’s such a simple appetizer to make for a witch themed Halloween party yet it really is impressive looking. 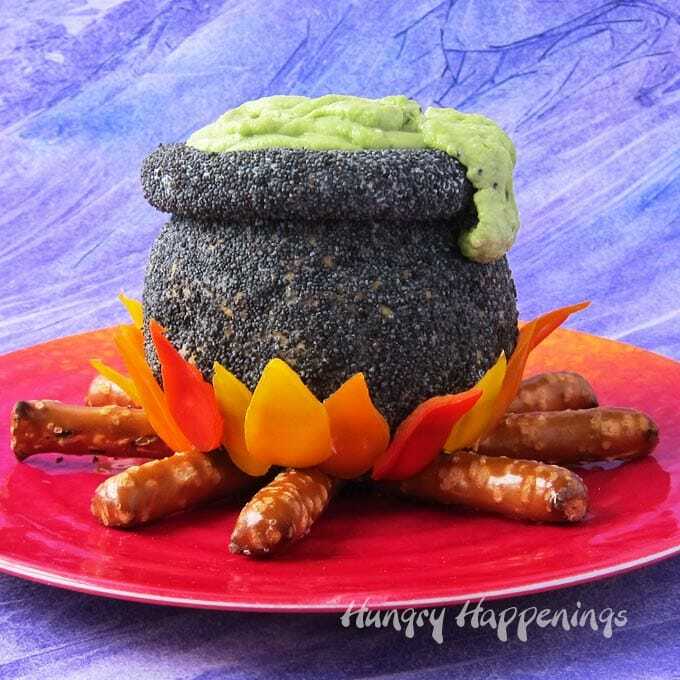 I’ve served these cheesy cauldrons at several parties over the years and they are always a hit with my Halloween party guests. 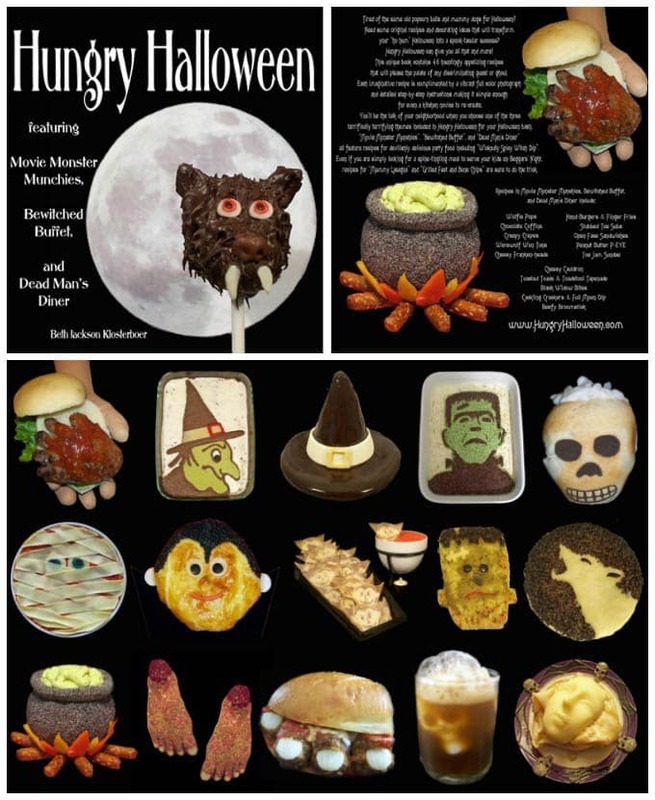 There is nothing more exciting to me than creating fun food for our Halloween parties which we’ve been hosting since 2007. My friends and family encouraged me to put my ideas into a cookbook and I’m so glad they did. Writing that book lead me to blogging and I couldn’t be happier sharing fun holiday and party recipes here at Hungry Happenings with all of you. We still host Halloween parties and each year I try to come up with a clever way to serve cheese. My party guests always gobble up any cheese I serve and they always appreciate a good cheese ball recipe. This cheese ball cauldron is simply made using a blend of cream cheese, cheddar cheese and bacon. The beauty of this food craft though, is that you can use your favorite cheese ball recipe. I have several other cheese ball recipes you can choose from. My favorite is the Roasted Garlic Parmesan Cheese Ball, but the Camembert Cheese Ball, Roasted Red Pepper Cheese Ball, the White Cheddar Cheese Ball are wonderful too. You can even make a sweet version of this Cheese Ball Cauldron using an Oreo Cheesecake Cheese Ball. I made one into a Pot of Gold for St. Patrick’s Day and the concept it exactly the same. You could pipe in some green decorating gel or pudding then add some spider and eyeball sprinkles to the top of your sweet cauldron. Watch this video to see how easy it is to create your own Cheese Ball Cauldron for Halloween. 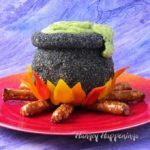 Cheddar cheese ball rolled in poppy seeds decorated to look like a witch's cauldron makes a fun appetizer for Halloween. Stir together 8 ounces cream cheese, cheddar cheese and bacon until well combined. Pour poppy seeds into a shallow bowl. Roll the cheese ball in the poppy seeds leaving about 1/3 of the ball on one end uncovered. Stir the remaining 3 ounces cream cheese until soft and creamy. Spoon into a disposable pastry bag. Snip off the tip of the bag and pipe a thick tube of cream cheese around edge of the uncovered area creating the rim of the cauldron. Sprinkle poppy seeds over the rim and top of the cauldron. Pipe a 1 1/2 inch round of cream cheese in the center of a plate. Break off 2 1/2 - 3 inch pieces from the ends of the pretzel rods. Arrange 10 pretzel rod pieces around the cream cheese on the plate so they look like logs on a fire. Enjoy the inner pretzel pieces as a snack. Set the cheese ball cauldron on top of the logs. Cut thin slices from the peppers then cut them into tear drop shaped flames. Attach them to the base of the cauldron using the remaining cream cheese. Spoon guacamole into a pastry bag. Cut off the tip and pipe guacamole into the top of the cauldron. Allow a bit to drip over the rim. If you make this Cheese Ball Cauldron and share it online be sure to link back to this post, mention Hungry Happenings and use the hashtag #hungryhappenings. If you’d like your picture to be featured in the Hungry Happenings Readers’ Gallery, be sure to send it to beth@hungryhappenings.com. Previous Post: « Fudgy Fruit Roll Notebooks make a fun back to school snack. Thanks so much! That’s so nice of you to say. I’m glad you like the cauldron. Thanks. I love the Oreo Cheese Ball idea too! You really are the queen of Halloween!! Thanks, I’ll take that title!!! love a ll the receipes!!!?? Omgosh you are so talented and creative. It’s beautiful!! I will be making a this and bragging on you the whole time lol. You are amazing! I will definitely be subscribe to your page!! Thanks you so much Leeanna. That’s so nice of you. I do hope you have a wonderful time make your cheese ball. Thanks for subscribing.